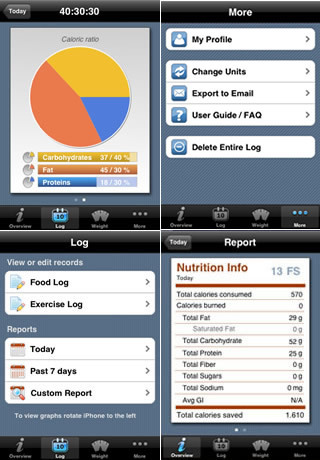 ► The most comprehensive diet app available! ► No internet connection required, complete database is offline! Tap & Track implements Apple’s philosophy of simplicity but at the same time offers hundreds of amazing features that you’ll love to use every day. The app never requires internet access, so you can keep track anytime, anywhere! ✓ The only calorie counter that works offline! ■ View nutrition data: calories, protein, carbohydrate, fat (and saturated fat), fiber, sodium, sugar. ✓ Pick, add, edit and resort predefined exercise list. ✓ Select between three different exercise intensities. ✓ View average consumed calories and other nutrition info by user defined period. The Tap & Track will allow you to keep track on your calorie by calculating your Basal Metabolic Rate (BMR) and finding the daily calorie needs of your body based on your gender, age, weight and height. The app also considers the type of the job you are into and applies the very well-known Harris Benedict Equation while doing the calculations.